Try this with any fresh or frozen fruit (apples, peaches, pears). And it’s best served with vanilla ice cream! Thaw fruit. Do not drain. Place in baking dish. Stir in sugar. In bowl, combine oats, brown sugar, flour, cinnamon. Cut in butter until mixture becomes crumbly. (Don’t be afraid to use your hands!) Add nuts. Sprinkle over fruit. 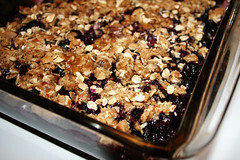 Bake in 375 degree oven for 30-35 minutes until fruit is tender and topping is golden.